If your to-do list is a mile long and your gutter cleaning is at the bottom of it, but the rainy seasons are coming, call our company for an appointment now. Our company has been around for many years, and we have gardeners who specialise in gutter cleaning services. And if you are going to have your gutters cleaned by someone, they better be specialists in it. And that is what our company is offering all its customers from Canary Wharf – a highly professional and efficient gutter cleaning service. 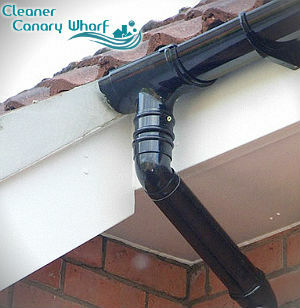 Our gardeners will make sure your gutters and downpipes are clean and safe for the water to flow through them. If you notice leaves or twigs coming out of your gutters, or that the water is not flowing as much from your downpipes, you should call for help right away. But even if you have not sensed any problems, it is recommended to have your drainage system thoroughly cleaned at least two or three times a year. Make sure you do not skip your gutter cleaning job, maintaining properly working drainage system will save you a lot of pricey problems in the future. Clogged gutters or downpipes can cause a great number of problems to your landscape and house. To be smart and to prevent them, please call our company right away. 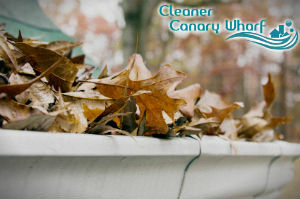 Our gutter cleaning service is efficient and will help you save your house from floods and rotting wood areas. Give our company a call as soon as possible and inquire more about our free quotes and our many packages. We can even customise our service according to your specific needs and your budget. Our gutter cleaning service is available to anyone from Canary Wharf, E14 at any time, we work seven days a week and on bank holidays.